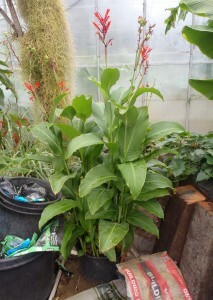 This is one of the two species of Canna in the display. Despite being called Indian shot this species originates from the South Americas and Caribbean. It’s name comes from the resemblance that it’s small hard seeds have to shotgun pellets or ‘shot’. One of the synonyms for Canna indica is Canna edulis, meaning edible canna, and this reflects the use of the rhizomes as a source of edible starch which can be extracted and purified or eaten by boiling the tubers. The Plants for a Future database gives this crop a three apple rating suggesting it is pretty good.